With all the buzz about the forthcoming Samsung Galaxy S4 this week, it's easy to forget where this all started. We take a look at some of Samsung's first forays into the Android market. These days there seem to be dozens of Samsung Galaxy devices with a variety of names like the Note, S, Mini, Tab, Xcover and so on. 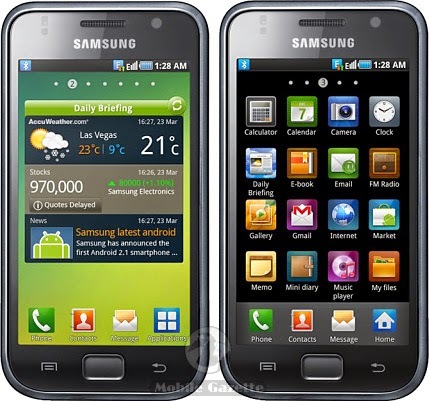 But in the beginning was the plain old Samsung Galaxy (model number SGH-I7500) which came before any of them. Viewed from 2013, the 2009 era Samsung Galaxy is a bit of a shock to look at. Modelled after traditional Samsung designs the Galaxy featured a 3.2" display on the front and a very large set of physical buttons. The display is a pretty basic 320 x 480 pixel panel, inside is a 528MHz CPU with just 128MB of RAM. On the back is a 5 megapixel camera, and as with almost all Android devices the Galaxy had 3.5G support, WiFi and Bluetooth connectivity plus GPS. The specifications may seem primitive, but they were roughly comparable with the Apple iPhone 3G that it was competing with. The operating system was Android 1.5 with an update in some regions to Android 1.6 (unofficial updates to 2.3 exist), but the Galaxy become obsolete pretty quickly and it was replaced by the Samsung Galaxy Spica later in the year. Samsung's first generation of Android devices were a bit quirky and not hugely successful. But all of that changed in March 2010 with the announcement of the Samsung Galaxy S (model SGH-I9000) which introduced the high-end Galaxy S line.. and also kicked off a massive legal row with Apple. A black slabby phone with an overall design that certainly wasn't a million miles away from the iPhone 3GS, the Galaxy S sported a 4" 480 x 800 pixel display, a 1GHz CPU with 512MB of RAM, a 5 megapixel camera plus many other features that were relatively groundbreaking such as Gorilla Glass and a dedicated GPU. 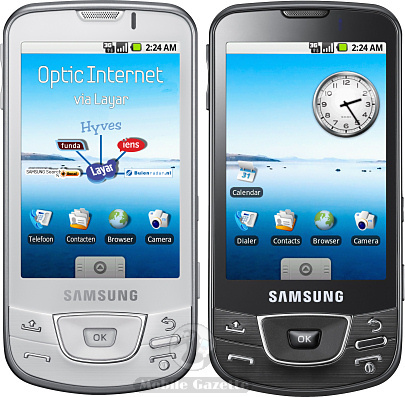 There exist many different variants of the Galaxy S including a slider version and one supporting the now-obsolete 4G WiMAX system. The operating system out of the box was Android 2.1 with the Samsung TouchWiz interface on top, with an official upgrade to Android 2.3 available plus some unofficial upgrades to Android 4.2. The Galaxy S was a sales success with a reported 24 million units shipping worldwide, and it establish a successful series of devices including the Galaxy S II, Galaxy S III and also the Nexus S.
The difference between the two devices (released just one year apart) is significant - the original Galaxy would be unusable by today's standards, but there are still many handsets on the market with a specification similar to the Galaxy S. The latest version - the Galaxy S IV - promises to be another major step forward and has already generated significant (and free) media coverage for Samsung before its official announcement. Over 100 million Galaxy S handsets have been sold since launch - and with the latest generation we suspect that 200 million sales will not be far off!